How would you Spend $11.6 Billion? Home > How would you Spend $11.6 Billion? 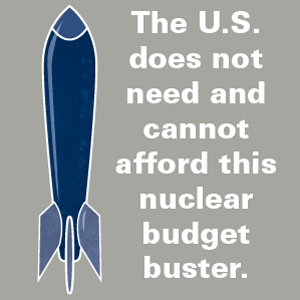 In our recent call to reallocate U.S. nuclear spending to programs that better address 21st century security concerns, we asked people to tell us what they would buy with the $11.6 billion the U.S. expect to spend updating the B61  – a budget busting relic of the Cold War that is stationed in Europe. Here’s what a few of you had to say. [The U.S.] should spend the money to reduce rather increase this power. Since we are the number one nation with this capability, and if we truly want a chance for peace, we should be the example of nuclear weapon reduction. Spending this money to convince other nations to do the same with the US as a leader, I am sure we could, diplomatically, trade-wise or any other-wise, truly be a moral leader and have money left over. These suggestions are valuable not only for their insight but also because by joining the conversation Bobbie, Raymond and Helmut are sending a clear message to Congress and the Administration that this is an issue that people care about. We, as Americans, must continue to send our leaders the message that it’s well past time to reduce our reliance on a nuclear force that does not address the threats of today. In doing so, we can create a world where nuclear weapons can never be used again. Keep tweeting #solidgoldnuke  and tell us what you would rather buy with $11.6 billion .